The Fourth International Workshop on RESTful Design (WS-REST 2013) aims to provide a forum for discussion and dissemination of research on the emerging resource-oriented style of Web service design. Over the past years, several discussions between advocates of the two major architectural styles for designing and implementing Web services (the RPC/ESB-oriented approach and the resource-oriented approach) have been mainly held outside of the traditional research and academic community. Mailing lists, forums and developer communities have seen long and fascinating debates around the assumptions, strengths, and weaknesses of these two approaches. The RESTful approach to Web services has also received a significant amount of attention from industry as indicated by the numerous technical books being published on the topic. 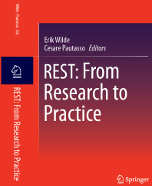 This fourth edition of WS-REST, co-located with the WWW2013 conference, aims at providing an academic forum for discussing current emerging research topics centered around the application of REST, as well as advanced application scenarios for building large scale distributed systems. All workshop papers are peer-reviewed and accepted papers will be published as part of the ACM Digital Library. Two kinds of contributions are sought: short position papers (not to exceed 4 pages in ACM style format) describing particular challenges or experiences relevant to the scope of the workshop, and full research papers (not to exceed 8 pages in the ACM style format) describing novel solutions to relevant problems. Technology demonstrations are particularly welcome, and we encourage authors to focus on lessons learned rather than describing an implementation. Original papers, not undergoing review elsewhere, must be submitted electronically in PDF format.